It goes without saying that unhealthy sleeping patterns are amongst the most common problem which leads to a range of different issues. And, when it comes to it, the mattress is one of the main causes for this. With this said, we’ve decided to take the liberty of providing you with a few things that you might want to consider if you wanted to make your air bed a lot more comfortable. While we understand that this is likely to be a temporary solution, it is still important to make sure that it is supportive and reliable enough to prevent any issues. Here are a few things that you might want to take into account if you want to enhance the quality of sleep on your air bed. 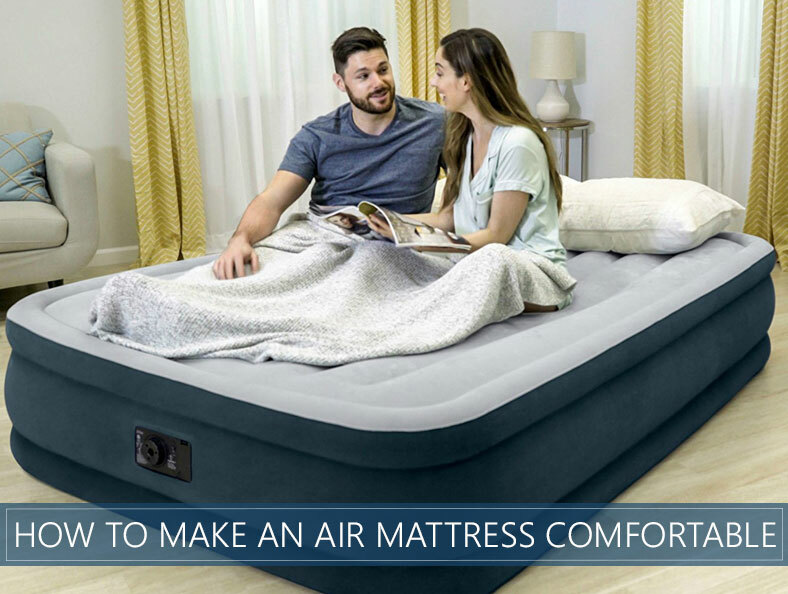 What you might want to consider is the fact that an air mattress (inflatable bed) is nothing but an inflated air into a structure that has been preliminarily enclosed and made in the form of bed. With this said, the air inside is bound to get warm as the weather becomes hotter. The same is true for when the weather becomes colder – the air is also going to cool off. To prevent any serious alterations regarding temperature, you should prepare the proper spreading of bed sheets alongside mattress covers. This would prevent you from feeling uncomfortable due to the severe temperature changes. This is another straightforward and quick way to improve the overall quality of the inflatable mattress. It is because the vinyl bottom layer of the bed is not going to augur that good with a surface that’s harder. These include hardwood floor, for example – it is certainly going to make your sleeping quite rough. For this reason, you can put it on a mat or a rug, and this will significantly increase the overall quality of your sleep. And if you're wondering how to make an inflatable mattress quiet, this trick can help you with the noise as well. This is one of the most affordable ways to substantially increase the overall quality of the bed. This is going to ensure that you don’t sleep on the characteristic rubbery surface of the air bed. In cheaper solutions, this surface feels particularly uncomfortable, and with a mattress topper, you can easily get rid of those issues. The topper is going to maximize the comfort as much as it is actually possible. It is also usable on regular beds as well. This is one of the things which is going to enhance the comfort of your air bed substantially. It is also going to ensure that you would be capable of getting out of the bed a lot quicker and without having to put in as much effort. The reason for this is that the overall height would be a lot more. If you wish to enhance the quality of your sleep substantially, box spring is another thing that you might take advantage of – it is quite convenient. There are tremendous and undeniable benefits which are associated with the usage of a proper pillow. They can’t be overstated. For this particular reason, you should always make sure that you have a great and appropriate pillow for your bed. This is something that applies to regular mattresses as well. 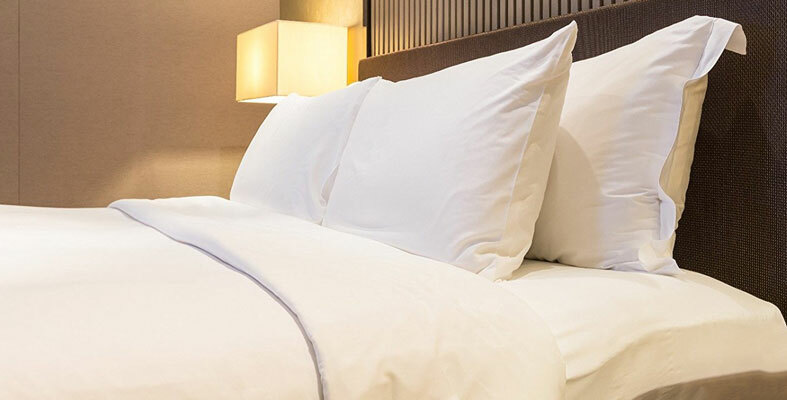 It doesn’t matter if you have the most expensive mattress on the market, if your pillow is uncomfortable and inappropriate, this could cause a lot of issues. Having a headboard over your head is something that you might want to consider for each bed that you use. The headboard is likely to prevent your pillow from falling off as you sleep and causing disruptions. An inflated mattress is unlikely to ever have a board over it, so you can put it right next to the wall to resemble this sensation. 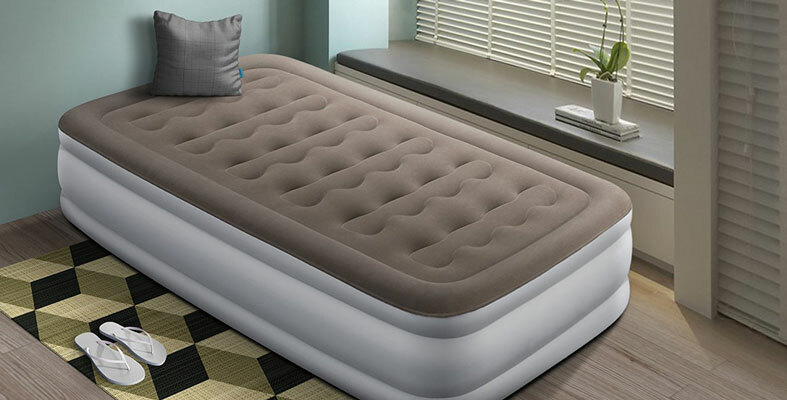 One of the most important factors which are going to impact the quality of the sleep in an air bed is the amount of air that it contains – this is something critical. If you have too much air in it, the inflatable bed is going to feel very firm. If you don’t have enough, on the other hand, this is going to cause it to sag and to be unable to support you properly. This is something that you want to prevent. Make sure to inflate and to deflate the bed as much as it is needed to achieve the perfect specification. This is something fairly individual as it would obviously vary based on your actual weight, for instance. As you can see, an air bed could be adjusted to fit your requirements for a reliable and comfortable sleeping solution. Of course, this is something that should only be used temporarily as it is incapable of bringing any long-term comfort and support. An air bed is awesome for your guest room, but it doesn’t mean that you have to keep it ill-maintained. Following all of the above is going to ensure that you get a bed that’s supportive, comfortable and cool. They are particularly affordable, so keep in mind that they would bring tremendous value for your money as well.